Ph/Ion Meter suits GLP-compliant research laboratories. OAKTON pH/Ion 2100 meter handles pH, ion concentration, mV, and temperature measurements. 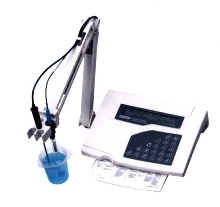 It features selectable 0.001/0.01 pH resolution with Â±0.002/0.01 pH accuracy. Real-time clock marks calibration and stored data with date and time stamps. Users can calibrate pH and conductivity to up to five points and define schedules for recalibration. Nonvolatile memory stores up to 50 data sets, and meter's RS-232 output sends readings to printer or PC. Vernon Hills, Ill.-Cole-Parmer Instrument Company introduces the OAKTON pH/Ion 2100 meter for pH, ion concentration, mV, and temperature measurements. The features, accuracy, and resolution of this benchtop meter make it ideal for the most stringent GLP-compliant research laboratories and facilities. The pH/Ion 2100 meter features selectable 0.001/0.01 pH resolution with ±0.002/0.01 pH accuracy. The real-time clock marks all calibration and stored data with date and time stamps in order to meet GLP requirements. Calibrate pH and conductivity to up to five points for high accuracy over the entire measuring range. Define a schedule for recalibration and an alarm reminds you when to recalibrate, ensuring accurate, consistent measurements. The nonvolatile memory stores up to 50 data sets, allowing you to document large volumes of critical ISE, pH, or mV measurements. The RS-232 output gives you the versatility to send readings manually to your printer or PC at the touch of a button, or to program the meter to send data at user-defined intervals. The meter also features selectable manual or automatic temperature compensation for accurate readings, and a two-line display that shows pH, ion, and mV readings simultaneously with temperature and time. For more information, stop by booth #464 at the Pittsburgh Conference (PITTCON) CA at the Morial Convention Center in New Orleans, La., March 17-22, 2002. Contact Cole-Parmer Instrument Company, 625 East Bunker Court, Vernon Hills, Ill. 60061. In the U.S.A. or Canada, call toll-free 800-323-4340. International customers can call 847-549-7600. Visit us on the Internet at coleparmer.com. OAKTON is a registered trademark of Cole-Parmer Instrument Company.